Got a lot of paint stripping done today. Basically, that's all I did for about four hours. Got a good strip done of the bow to the trailer up to the keel. The center part of the ship is really hard to strip. My guess is there is more paint there. It's basically three coats I'm stripping. Two layers of red and one primer grey. And was able to strip the port side of the keel. This went a lot faster then the starboard side. I'm getting better at this paint stripping. I did ask myself several times today, why am I doing this again. Doubt I'll do this for a while. Next year, It'll just be a bottom sand and repaint. You can see the small repair job, I had done also in this photo. It's the square to the very left of the photo right under the water line. One problem I'm going to have to solve is how do I strip, sand and paint the parts of the ship that are resting on the trailer? I asked the harbor master if they have any stands and he said no. But he did provide some names of people who might have something. Little leary about this part of the strip, sand and painting. If the weather cooperates, I will hopefully be done with all of the stripping by Thursday. Tomorrow, I'll finish off the starboard side near the keel and possibly begin stripping paint from the bow. Was at the boat today with the second mate. He did some sanding and added brasso to the pulpit rails. 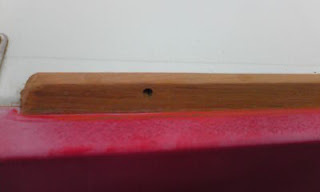 I glued down the nicely varnished piece of threshold wood to the main hatch with guerilla glue. First time ever doing this. I was going good until I clamped the piece down to hard and left two small circles where the clamp bit into the wood. I put light cardboard paper in there to avoid this but it wasn't enough. So now, I'll probably have to resand it later and then revarnish it. Lessons learned. Much of this stuff, I'm doing for the very first time. Everytime I tried to do some sanding the skies literally opened up with Biblical type rain. Got totally drenched twice. So called it a day. Finally called it a day. The boat's name was officially changed from Mental Floss to Scarlette. I stopped by the Japanese Compulsory Insurance place today and picked up the new title with the name change and my name added as the owner. I believe I am the fifth owner of this ship. 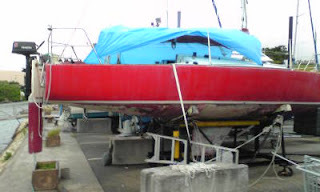 Saw Greg Martin at a nearby boat store and he tried pretty convincingly to get me to get the boat moored at Ginowan Marina instead of Kadena Marina. I'm going more toward that way. That's all I did today. The day started out all sunshiny. Scarlette was to receive her Japanese Compulsory Inspection at 12:20 p.m. but the guy showed about an hour early to try to avoid the rain. The inspection was pretty light. Although Scarlette needs a ventilation hole put in by her fuel tank and an anchor light at the top of the mast, she still passed inspection. I'm supposed to pickup the title tomorrow afternoon with her official name change! Was able to get some sanding done on the front toe rails, peeled some glue off the old main hatch and did some re-varnishing of the main hatch. New meets old. A freshly sanded bow toe rail meets an unsanded beam toe rail. Glue left overs underneath main hatch threshold piece. Once the varnish dries, I'll be using Guerilla Glue and two clamps to fasten the varnished piece to the main hatch. Had to leave Scarlette open though...not something I wanted to do but because of the rain, I didn't want to redo the varnish job I already had to redo. Kinda tired today as I was up late working on the main website for Scarlette at http://www.scarletteboat.com/. Also stopped by my old office and had Bangee agree to make me a new logo and name and Rey Ramon agreed to shoot pictures once I get Scarlette underway. Despite the rain...didn't seem like I got much done, but I did. Today worked about five hours scraping the bow to the trailer. I actually got a lot done. Started feeling a little woozy later so I'll have to wear the mask tomorrow to avoid overexposure to the Zip Strip. I'm getting a lot better at stripping now. Paint that is. 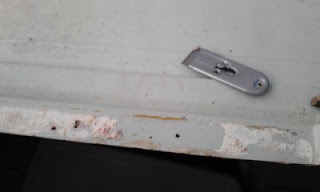 I also re-sanded the main hatch door and and threshold pieces of wood the second mate had previously done. And started varnishing them. The varnish job went great -- put two coats on. Then like the green horn I am I set them out in the sun to finish curing. Big mistake. Both pieces of wood got sun blistered so it's back to sanding again. There was a freak squall this afternoon. I got totally soaked for about 20 minutes then it turned to cloudy skies after several hours of pure Okinawa sunshine. One small victory was the varnish job seemed to hold up in the rain. Below are the before and after photos of the main hatch. Fresh from Kyushu -- we got back yesterday -- I began today the hardest part of this boat refurbishment: stripping off the bottom paint. There's a saying that most boats could always be two feet bigger -- but in this case I'm glad it isn't. In fact wish it was a bit smaller. First I had to fix a light I tried to fix last week and wound up screwing up. The bow light needed the ground wire I pulled out put back in so that's where I started today. 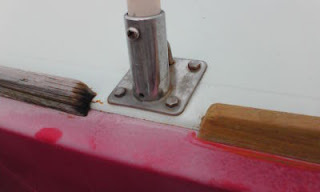 With that finally fixed, I focused attention on the bowlight to ensure it was working for the Japanese Compulsory Inspection the boat is scheduled to receive on June 26. It was I'm going to have to check the light bulbs again to ensure that I have replacements on hand. After getting the lights working, I started on the hard job of stripping the bottom paint. I had talked to the guy I had repair it a few weeks ago and he said that I could strip the paint down to what's called the gel coat. So that's what I did. 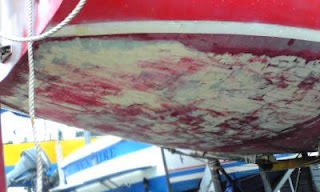 Here's the results of five hours of zipstrip on both sides of the keel and the starboard side of the boat. Click on the images to get a closer view. Lastly, got to remember to wear a long sleeve shirt and old pants. That zipstrip burns like Fire when it gets on your skin. You probably won't notice the difference until you look close. I took a power spray machine to the hull of Scarlette today. Some of the bottom paint -- which I plan to strip off with Zip Strip after we return from vacation -- started coming off. I've definitely got my work cut out for me. But I'm considering scaping the bottom then waiting until I'm done with the topside refurbishment before painting. 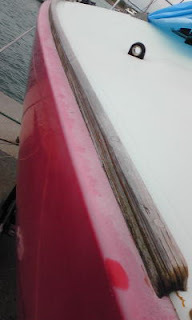 The anti-fouling paint I bought -- of course red -- cost 12,000 yen a gallon. About a $120. Icky told me that one-gallon should do it and that I should apply three coats. Well off on vacation. Will return to Scarlette and updates next Wednesday. Today, took the mildew smelling cushion covers to the local laundromat here to see if their public washing machine could do any damage to the mildew smell. The first mate would've killed me if I would have loaded those into our own washing machine. So off to the laundromat I went with the second mate. After 30 minutes or so, (finally got a haircut, while I waited) came back to the laundry room and some lady had pulled out my cushion covers from one of the washers. She said, "Oh were those yours?" ...slight mildew smell still there. Took the covers home to hang off our balcony in direct sunlight to see if that'll work. But it looks like tomorrow, I'm off to the dry cleaners. 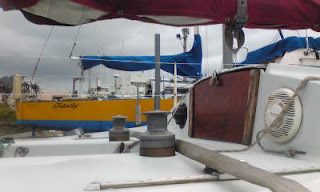 The skipper (AKA: Captain J) spent the morning giving Scarlette a hosedown and complete scrub of her deck. The wood toe rails really needed it as a greenish-brown material -- possible growth -- was attached. It took about three hours to scrub everything down to include reattaching the @#$% hose that kept coming apart ONLY after I would climb up on deck via an eight-foot ladder. Well at least this is good summer-break exercise. Plan is to get the toe rails ready for sanding and then varnishing after we get back from Kyushu. 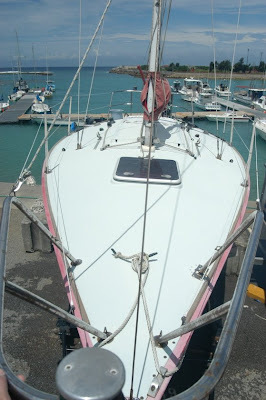 We are going to Kyushu -- via plane and not this boat -- this Thursday or five days. Should return June. 23. The V-berth also got a complete scrub down up to the front area where sails can be stored. The skipper was a little scared to go too far forward in case Scarlette my tip over on the trailer. Probably wouldn't happen but he wanted to avoid any catastrophe. Today, the skipper and his second mate took off my old name, "Mental Floss." It took about two hours to razor off the white vinyl lettering and it doesn't seem like goo gone is gonna make it any easier taking the residue off. "The name Mental Floss was just a little too zen for me," said the skipper. 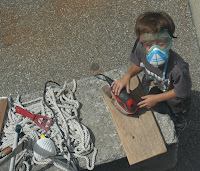 The second mate started sanding the cabin "doorway" before a varnish job later this week. Spent about two and a half hours today, applying rubbing compound via a buffer to the hull of Scarlette. Icky stopped by to tell me that the repair he did would also need sanding once I begin sanding the bottom part of the hull after I strip the bottom paint off. He also handed back my key.